Two early career researchers share their thoughts on understanding the science-policy interface. Policy making doesn’t happen in isolation: it is a complex picture. From my naïve science-centred point of view, I saw science as being a key part to informing policy. While that is not wrong, in reality science is just one of many factors and the role of politics and public opinion should not be underestimated. To complicate matters, policy making occurs within a framework of numerous local and global commitments and agreements that may change over time, shaping the way policy is made. Also, a lot of parties are interested in influencing policy: non-governmental organizations, landowners, researchers, Government agencies and commercial organizations, among many others. The workshop was very informative and I would highly recommend it to anyone interested in the science-policy interface. So how should scientific advice be provided? Sally Thomas, Scottish Natural Heritage’s Director of People and Nature gave us some insight on how to tackle this. Starting with the topic to present, it needs to be relevant (not only to the scientific community…), and it is important to be aware of any political or public opinion challenges relating to it. The most important part, as I saw it, was to know and understand the audience. 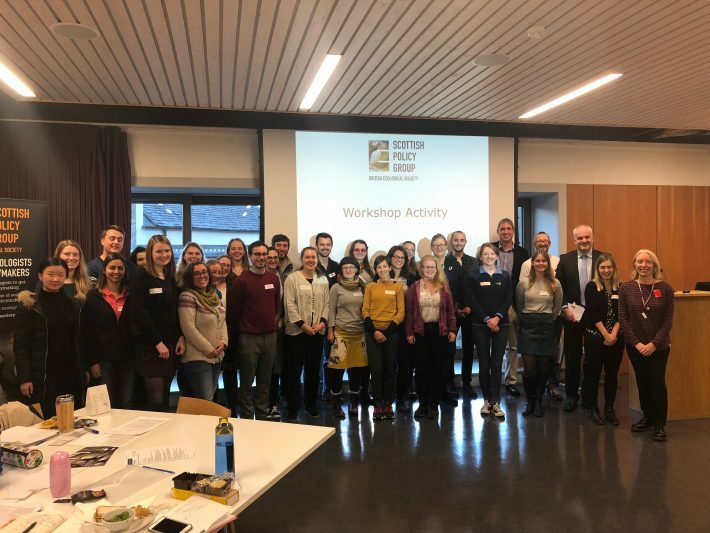 Scientific advice needs to be accompanied by evidence, and Jeremy Wilson, RSPB Scotland’s Head of Research, gave examples of success stories where evidence-based science has informed policy and management of land and resources. But evidence may come with uncertainty, and a good way to acknowledge this is to highlight where consensus lies and where there is debate! The afternoon involved a practical exercise which was great fun. 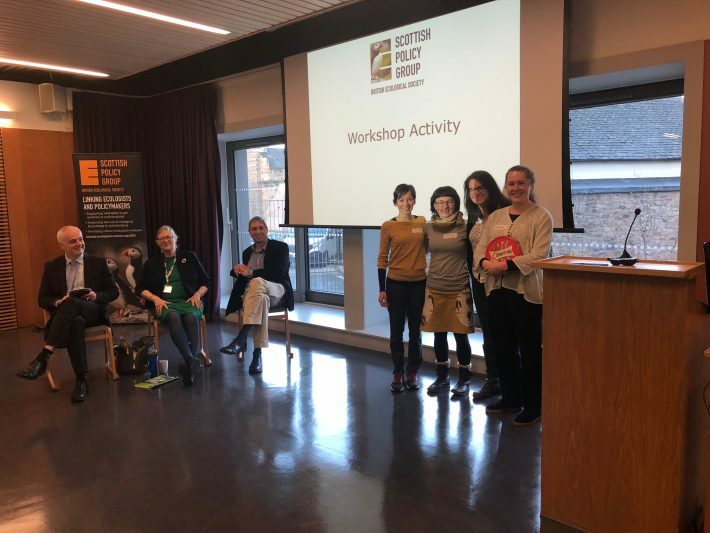 We were split into small groups and given a research paper which we had to summarize into a 60 second elevator pitch, to be presented to two invited Members of the Scottish Parliament (MSPs). After an hour of brainstorming and drafting ideas, we encouraged Rosanna from our team to be the one facing the two MSPs. She did an amazing job, so good we won the contest! It was very interesting to see how each group prepared their elevator pitches on very diverse subjects, and the feedback we got from the two MSPs was very valuable. Overall, a great day learning about the science-policy interface! Science is only one of the factors influencing policy (others include for example politics, economics and public opinion). Therefore, it’s important to think about who we want to influence, who we can influence, and how we communicate our message. There are many policies, policy makers and influencers, and there are many ways to communicate scientific evidence (e.g. infographics, case study examples, invite influencers or your MSP into the field) to bring your message to life. Is your research relevant to policy decisions being made now? We were encouraged that engaging with the political decision-making process in Scotland is possible, and not to be put off if we are at an early stage in our careers and, importantly we should not undervalue our expertise and knowledge. The workshop not only gave me a clearer understanding of what the science policy interface is, but also provided the opportunity to meet other early career researchers from around Scotland and make new friends. It may also be more appropriate to feed in through other channels. For instance, BES position themselves as an honest broker of scientific evidence, and we can feed into their responses to consultations via the Scottish Policy Group. You need to know your audience and the policy context that your message feeds into. The elevator pitch exercise taught me a) that one minute is very short, and b) the importance of having a clear, simple message that is presented in its relevant policy context. I really enjoyed the event and am grateful to the BES-Scottish Policy Group for organising the day. 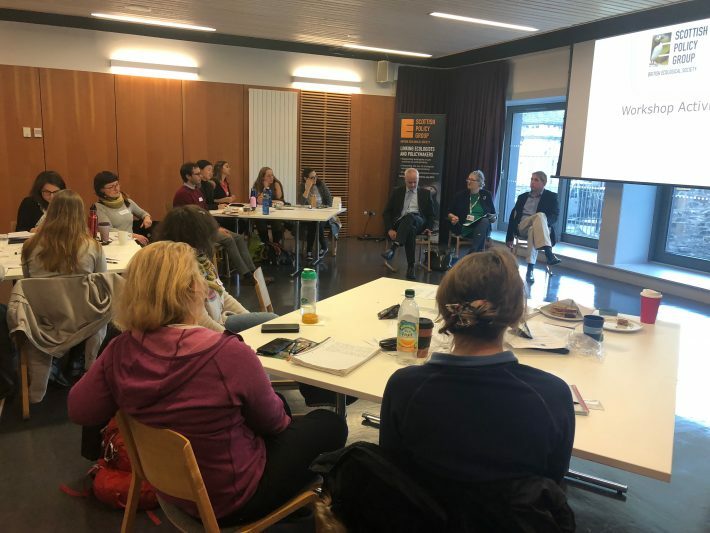 I’d also like to thank Claudia Beamish MSP and Mark Ruskell MSP for joining us and giving their feedback on our pitches, which gave the training more impact. Researchers listening to feedback from Claudia Beamish MSP, Mark Ruskell MSP and Jerry Wilson, RSPB.